‘When I was a little girl I believed what I was told over and over again: that I was evil, that I deserved to be tortured because I was the Devil’s child …’ In April 2007, foster-mother Eunice Spry was sentenced to fourteen years in prison for her sadistic abuse of the children in her care. The details of her cruelty were so sickening they shocked the country. Alloma Gilbert was one of Spry’s young victims, sent to live with her at the age of six and left at her mercy for eleven brutal years. Eunice used her own twisted religious beliefs as an excuse for punishing her foster children.When she took them to live on an isolated farmhouse, the abuse escalated to terrifying levels – a stick was thrust down Alloma’s throat so often it was stained red with blood, she was starved for over a year and survived only by secretly eating pigswill, and the vicious beatings were relentless. At the age of seventeen she finally escaped but, alone in the outside world, she fell prey to abusive men. It was the birth of her baby daughter that saved her, that finally taught her what love really is. 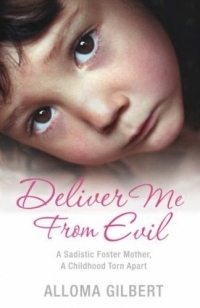 Written with powerful honesty, “Deliver Me From Evil” is a moving and inspiring story of survival.